A cup of shaved ice + Belligerent teen = Capped daddy. 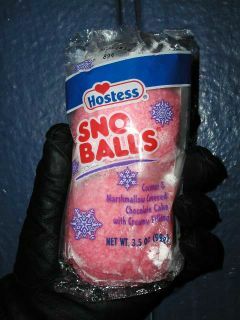 Hostess Sno Balls: not yet demonstrated to encourage violence! Then again, why does it look like they're being held up in an ominous gloved hand??? Awesome photoshopping, dude. Made me laugh out loud, but then I'm kind of simple like that. It's amazing what you can do with the free "Paint" program that comes with the computer. ;-) It looks like I did it with a crappy labelmaker!